Off to the nail shop we go for a time of relaxation. Typically I go alone to the shop but this time Mike decided he wanted to tag alone and get a manicure and a pedicure also. Okay, no problem, because for the last 15 plus years I have been going to the same guy. I knew my process was going to be longer than Mike’s but I know what I want and again my guy has been taking care of me for 15 plus years. He doesn’t even ask me to pick out my color because he knows that I want a French manicure on my fingers and toes with gel on top. While my guy,Terry, is finishing up with my pedicure Mike looked over and asked, “What color are you getting?” “Color? You know I don’t do color.” “Well I want you to get this pink right here.” “Are you serious?” Listen, I had no idea that I was married to a French manicure. The separation anxiety and disquietude became too real in that moment. I was not okay with this at all and I did not know why because it was just polish. So Mike saw the anguish on my face and said, “DeeDee, you can come back next week and change it if you do not like it.” Okay, lets do this! Here comes Sunday and nothing that I wanted to wear matched these pink toes and pink finger nails :-(. Now all of the feelings I thought I had relinquished at the salon with an okay I will try color really had reappeared on the scene. I was struggling going from outfit to outfit because of a dumb color on the smallest part of my body. I know you nail color wearers are wondering why was I tripping and that it was not that serious. I took a picture and sent it to my daughter to show her my toes protruding through the sandals looking like they were waving flags saying look at me. (LOL) She told me it was fine and it doesn’t have to match. Great, let me just take this pump with me if I still feel uncomfortable about it. Well guess what I did when I arrived at church? YES! I put them pumps on to quiet down those hollering, bright, flag waving toes. Then the Holy Spirit began to speak to me. “This is how my people are.” I knew exactly what He was saying because I was teaching Bible study last week on this same subject. So many people are stuck on what’s familiar and are not able to travel untraveled territory because they turn around due to the fact they are not accustomed with it. The same feelings I had with just my nails is the same feeling that many have as it relates to any change in their lives. The children of Israel were stuck with how things were in Egypt even though they wanted out. God brought them out but they never received the promise land and when they got out they complained about going back. Change is necessary for growth. Stop complaining about every little thing and just go with it sometimes. Stretch yourself with possibilities. You know what I did this week? I went back and got another color because I don’t want to be stuck in any area of my life!!!!!! What a fantastic post! I can truly relate. I was that way for years and realized I was behaving the same way in other life situations! Thank you for this reminder to always remain open and not stay stuck! That was amazing. I often get stuck with the need to express my emotion or feels especially when I feel disappointed, espically with my husband. You just help me realize that sometimes I just need to go with it and see where it takes me. This is very true for me as well, my husband tells me that I need to be willing to change my routine sometimes, I guess I will. You are so right… For the last two Sunday’s I have sat on the opposite side the church that I normally sat on.. I saw people in the church I had never seen. And I am sure they thought I was a visitor . Dr. DeeDee I noticed the color on your nails and thought it looked lovely on Wednesday night. But I love how you can correlate God’s word with our everyday experiences. Change is good. Sometimes we do have the come out of our comfort zone. This is really a right now word to so many of us who find ourselves stuck and don’t even realize it. I saw 👀 that you had on Pink polish last week.I said to myself that’s a change for Dr.DeeDee.Wright change is necessary for growth🌾. This is awesome. I’m in a very uncomfortable situation right now and have to make a major life decision and I understand that in order to grow, I must sometimes be uncomfortable. Thank you for the reminder. You just helped a sister out! What a fantastic post. We have to be willing to get out of our comfort zone. Will put into practice. To God be the Glory. Thanks Dr. Dee you always keep us thinking and helping us to see the life lesson. Unstuck, I think it speaks more volumes then we realize. We are so used to how our spouses are going to treat us, the foods we eat, the routes we drive. I think we are more stuck than a man in quicksand. This is a shake up and shake down. Btw, I’m sure that color looked fabulous. But I like they way you were willing to try something different for your man. Good Morning Dr. Dee Dee… awesome and timely post as always. I definitely received this message! I’m facing this same situation as it relates to my job. My current job is comfortable with great hours but there is no opportunity for growth there. I need to get out of my comfort zone. Love, Love, Love this Dr. Dee Dee!! That was good Dr. DeeDee,we as people don’t like change because it takes us out if our comfort zone🙄But change is so good, we have too changed yo get too the next horizon in our life if we going to follow Holy Spirit lead, see how GOD lead them out of the wildness and they was not satisfy they wasn’t used to change they want it to ho back and didn’t reap the Promise🤔We have to study FOCUS❤️I loved this❤️❤️Thank you for sharing. Thanks for the post Dr. DeeDee! Change is not always easy but it is good and often times necessary. This was sooo good and also funny to me today. I was looking at your baby blue polish yesterday and thinking ‘hummm, Dr. Dee Dee is doing something different’.😊 Thanks for always being so practical while challenging us at the same time! LOL!!!!!!!!! Why did this just happen to me. I am a fan of purple and my nail designer fusses at me all the time about the color (even though she does magnificent designs with the color). So this time she did a really crazy off the beat and trail design on my one finger on each hand and the matching design on my toes. So when she finished I looked at her real crazy and she said “oh just leave it alone and breath. You can come back if you really hate them and I’ll changed them.” (she’s been doing my nails for 20 plus years). So I did and it was so funny because everyone noticed them a new was like that’s different. And the more I look at them, the more they grew on me. Just got to accept change and move on. Just breathe through it. You’re stepping on my fingers and toes (in a good way). Thank you! THank’s for your transparency, Dr DeeDee. This is so true! In small and big ways we dont realize how we are ‘married’ to things and patterns, until we are required to shift from them. I know exactly where I will be doing something differently today! What a mighty word! This really ministers to me as I’m someone who can be incredibly resistant to change. I sometimes feel the way we did it in my family is the best way and it’s the way it has to be. In essence, sometimes my family didn’t do it the best way… Lol. I appreciate and receive this word. I’ll be self reflecting on this all day. Probably all week. I love it! I just changed the pillow arrangement on my bed. I’m not getting stuck at any level. This is such s powerful message !! On point! I felt so guilty reading this . I needed this today. Time for me to stretch. This is beautiful I can truly relate with your experience. Thank you for sharing. Dr DeeDee, I like how you use small things as teaching moment. When my parents were alive they talked about not allowing the little foxes destroy things. I thought about that when I read your post. Thank you for being real in our lives. Truer words have never been said! Thank you for the confirmation. Good for you Dr.Dee Dee. One of the first things I noticed were your fingernails. I thought to myself, with excitement, Dr. DeeDee has color on her nails. They were very pretty and so was the next color. Your righ, nothing is constant except change. Yes! Change is necessary for growth, expansion, and increase. Only remaining stuck limits me from all the wonderful possibilities that are promised to me and are awaiting for me to pursue! Yes get out of my comfort zone and do life different! Love! Love! Love!!! Routines are boring at times and things are stirred up in the natural and spirit realm when we break free. I noticed the new color on Wednesday night and thought “Oooh color! I like the nails”. As a matter of fact when it came time for me to do my nails on Saturday I picked pink because seeing your nails reminded me that I haven’t worn that color in a while. People are always watching even the ‘small’ things and those ‘small’ things can inspire influence others. Thank you for yet another wonderful object lesson. Thank you! This blog has truly encourage me to step out! Bringing my gift of laughter from my testimony! Thanks Dr. Dee Dee for another on time word…Change is good! You are the best First Lady Ever.Love You!!! Dr. Dee Dee Good word, I needed to hear that I as well have struggled with change. I am encourage to move on and not get stuck. That’s real! I used to be that way too! Now I wear one color on my toes and a different color on my hands! French manicures were ALWAYS perfect to me because it’s classy, natural, matches anything and complimented my long French fry fingers as my husband calls them. Plus I have long nail beds so having nails with color was a huge reach for me. That was a really awesome story because it is so easy to get “stuck” like that in life. Thanks for sharing! Thank you and Great post Dr. Dee Dee, Change can be very difficult. Fear of the unknown tried to hold me back, but I learned at a young age to just go for it even when I was scared. I knew it was important to leave ‘Egypt’. Stepping outside the box created a whole new world of exposure. In other words, It worked by taking the limits off ‘God’ and trusting him which brought increase in my life. WOW! That’s amazing that something as simple as changing nail colors could say so much about who we are and how we think about things in life. I agree, change can be hard…I recently (I keep saying recently although its been almost a year) moved from MD to TX. You talk about “change”, that was HUGE! I’m from TX, but haven’t lived here for over 20 years, but it was all so new, challenging and uncomfortable (still is), but I know this change was necessary for me. I am adjusting, trying to keep an open mind and “stretching” myself, thoughts and perspective. I’m determined to be what, who and where I’m destined to be…after all, I love new things, meeting new people…a change and even new/pretty colors (especially on my nails). I too don’t want to be stuck within myself/life. Thank you so much because you rock!! Thanks for letting God use you and your life to help get us from being unstuck.. I pray continued blessings over you and yours! This is SUCH a timely word!! My employer offered me a job, in Baltimore, WITH a pay raise!! But I’m feeling stuck because I’m trying to sell my current house, I don’t have family there, I’ve never lived there, but I feel like I should just trust God and just Do It!! Thank you Dr. DeeDee, I really needed to hear this. I have been vascillating over a decision that i know i need to make. You just helped helped me make up my mind! Amen, Dr. Dee Dee, good for you. Change is good sometimes. I’m sure we have all been challenged a time or two about change. Here’s a little humor for you. I don’t cook a lot these days, my husband and I are empty nesters and so we eat out a lot but when I do cook, and what I cook is a home run for him, and we both like it, I say ok that was good, and I am going to make it again another time. So when I go to make it the next time I think to myself I am going to improve on this and I’ll add another ingredient or spice, but then when my husband taste it he says “what did you do different, I liked it better the other way.” And so I tell him that I was trying to improve the taste. He says “but the first time was a home run, stop experimenting.” My husband is very much a creature of habit when it comes to me cooking. I love experimenting with the food, what can I say? Awesome ..thanks Dr.DeeDee for sharing this is going to push me to come out of my comfort zone. Loved this post! It’s interesting because I noticed your bright blue nails at church over the weekend. I was sitting about 10 rows back thinking “Wow, that color looks great on her”. Not even knowing that it was something uncomfortable for you! Thank you for this message and tying it into something so relatable! Love it,this is so true! Lol Lol That’s big girl stuff. I don’t want to be stuck in any area also!!! But guess what in bible study, the first thing I saw was your pink nails. I said to myself hmm she changed her nail color and guess what you rocked it with your tan and white!!! It immediately caught my eye because I love color and change, it does help us grow. OOooooo so that is what was behind the light blue nail polish this weeekend!!! LOL. 🙂 It looked fabulous!!! Love to you always. 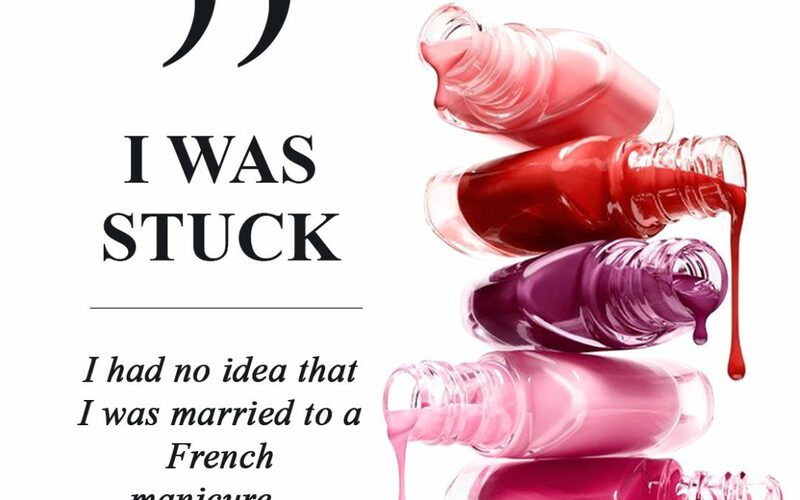 This was so awesome I so enjoyed reading about being stuck I was also stuck concerning polish I would wear bright colors on my toes and nurture on my finger what in the world my girls would call me old fashion so i have transform now i wear brights, red, pink, still staying safe.. so there are color i will not wear…laughing! I can change and be alright..
WOW,What an Awesome blog!!! This is a lesson fits any area of your life…thank you for sharing! sorry I’m turning this into a therapy session, but I watch you all the time and I love your teaching. You and Dr. Mike are so in-tuned with God, the word and each other the transparency is wonderful. I’m so grateful to God for his miraculous healing of Dr. Mike…I’ll continue living by faith, be blessed and thank you for sharing your life….